Since 2004, Feather and Black’s sleep experts have been designing and supplying bedding and beds to give you the best possible night’s sleep. With 6 different mattress types to choose from, its revolutionary pocket-spring technology gives you a sleeping experience like no other. Feather and Black even gives you a 100 nights mattress trial on almost all of its models, so you can be sure the mattress you’ve picked is right for you. Although, with luxury pocket sprung mattresses’ spring count (2,000 – 17,000 in case you were wondering), it’s unlikely you’ll have any problems. 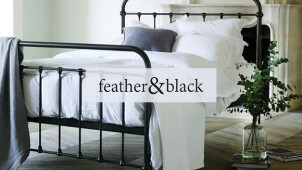 Feather and Black offers a variety of ways to help make your perfect bedroom a reality. The inspiration page is a great way to get ideas on colour schemes, tones and designs and you can also order fabric samples to make sure your new order fits your room perfectly. If you’re the type who likes to see things for yourself, pop into one of their stores and talk to a customer adviser. They’ll be happy to help you create the bedroom you’ve always wanted. How do I use my Feather and Black discount code? Check out Feather & Black’s clearance section for some absolute bargains! Is there a Feather and Black store near me? Very probably, take a look at their store finder. Can Feather and Black provide protection against stains? Yes, you can purchase a staingard protection plan here to insure you against certain stains and damages. Do Feather and Black provide recycling services? Yes, they will remove and recycle your old mattress and bed for a flat fee. If you are unhappy with your furniture you can arrange collection and refund within 14 working days from receipt (a collection fee is payable). This excludes upholstered items and custom orders, which cannot be returned unless faulty. For hygiene reasons mattresses cannot be returned once the packaging has been removed. The 100 night guarantee applies to certain mattresses purchased in-store. For linen, bedding and accessories you also have 14 working days from receipt to notify Feather and Black. Items must be in original packaging unless found to be faulty. You spend a third of your life in bed, so make sure you get the best possible night’s sleep. Luckily, the sleep experts at Feather and Black have an amazing selection of beds, mattresses, bed linen and everything else you need to make your sleep the most restful it can be. A Feather and Black discount code could seriously cut the cost of your order, so you can rest easy knowing you’ve got a great mattress at a great price. Feather and Black have an amazing mattress selection for all kinds of sleep needs. The Everyday Pocket Sprung offers support and comfort in a variety of tensions, whilst Tempur mattresses are made with visco elastic that moulds itself to the shape of your body, giving you a bed that fits you like no other. Zip & Link allows you to connect mattresses of different tensions together, great for couples with varying needs. When you’ve selected the perfect mattress, you’ll need some bed linen to dress it in. Feather and Black has a great range of luxury linen, made from 100% cotton exclusively for the company. A Feather and Black promo code could seriously cut the cost of your new linen, and completely lift the look of your bedroom. Choose from a range of gorgeous, soft and beautifully decorated linen to give the finishing touch to your beloved bed.